Water, soybean oil, maltodextrin, distilled vinegar, sweet cream buttermilk, sugar, corn syrup, modified corn starch, salt, potassium chloride, garlic powder, onion powder, titanium dioxide (color), phosphoric acid, xanthan gum, egg yolk, sorbic acid and sodium benzoate and calcium disodium edta (used to protect quality), disodium guanylate disodium inosinate, lemon juice concentrate, spices, propylene glycol alginate, natural flavors, soybean lecithin. This dressing offers rich Ranch flavor that is sure to please the heartiest appetite. 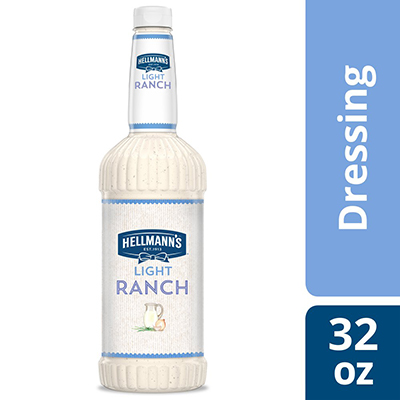 Hellmann's Light Ranch Salad Dressing offers premium quality with shelf-stable convenience. This gluten-free salad dressing is also versatile, with alternative applications ranging from marinades and dips, to glazes and finishing sauces. The Hellmann's name is recognized throughout the world for unrivaled quality and flavor. As part of Unilever, we understand consumers, your guests. We use this knowledge to help chefs and caterers keep up with people’s changing tastes.